Now that you've completed your Inventory Setup you can enter your starting inventory so that it will be accurate moving forward. Then, periodically you will do physical inventories at intervals appropriate for your facility. 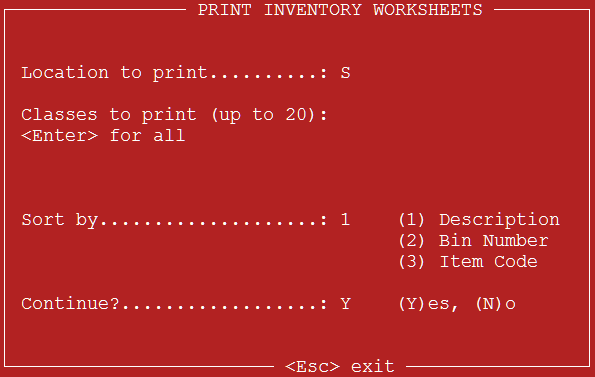 Step 1 - Print a Physical Inventory Worksheet. Go to Inventory or Inventory Control. This might be on your Master menu or our Food & Beverage/Retail menu. 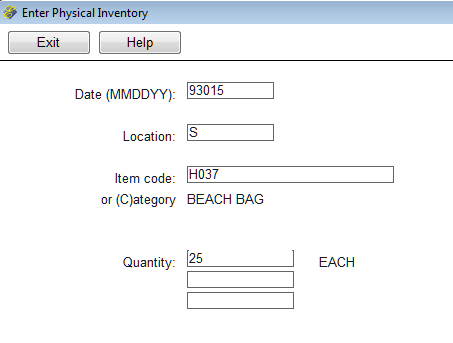 Then select "Print Physical Inventory Worksheet". A red screen will open. Answer the prompts based on your parameters. 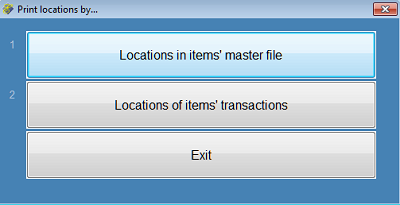 You can opt to print items for the locations in the items' master file or by the items' transaction. The items' master file locations are those locations you designated for this item. The items' transactions will include locations where the item might be but are not included in the items' setup. The default is "locations in the items' master file". After the worksheet prints you can print another worksheet for another location or class. Step 2 - Enter the quantity on hand for each item for each location. Go to Inventory or Inventory Control. This might be on your Master menu or our Food & Beverage/Retail menu. Then select "Enter Physical Inventory". It's best to work on one location at a time. A white screen will open. Answer the prompts based on your parameters. Type the date (MMDDYY format) and press Enter. Type the location code and press Enter. Type the item code and press Enter. Alternatively, enter the category and then the code. Type the quantity and press Enter. Pay attention. Don't type 56 when you mean to type 45. Your cursor will return to the "item code" field. Enter the next item and its quantity and continue until you are finished with this location. Then, to start the next location, use your keyboard up-arrow key to go to the "Location" field and then enter the code for the next location. When you are finished, use your keyboard "esc" key to exit the screen. A prompt will ask if you wish to update the batch now. We recommend answering yes, and updating the batch, even if you are not finished with your physical inventory. 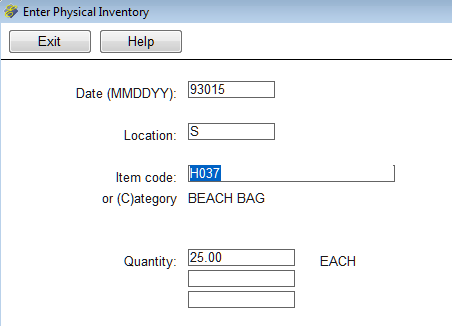 You should update the batch after each session of physical inventory entry. However, you can print prior to updating if you wish to make sure everything is correct. See the next section. For scanning physical inventory, see Physical Inventory Handheld Scanner. Step 3 - Update your batch. When you are finished entering your physical inventory, use your keyboard "esc" key to exit the screen. 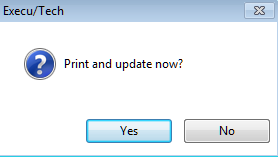 A prompt will ask if you wish to print and update the batch now. Answer Yes. A second prompt will verify that you want to update the batch. Answer Yes unless you want to review the batch first. If you review the batch, make sure to go back and update it. To get to the batch from the master or main menu, go to Inventory or Inventory Control and select "Print and Update Transaction Batch." See a sample Physical Inventory Batch Update. See also Batch Updating . You might want to print an Inventory List and Inventory Value Report. See Inventory Reports .